Furthermore, it has the right mix of power and price thanks to the mid-range Sandy Bridge processor and 4GB memory. There are one or two minor niggles that stop it achieving solid gold status but, overall, we're very impressed. Strangely, there's a protruding ridge underneath the laptop coming from the battery that easily adds a half an inch of thickness to an otherwise very slim chassis. The plus side of this is an ever-so slightly inclined typing angle, so it's not all bad. Speaking of typing, the Inspiron 14z gives you an isolation-style keyboard with cutesy rounded keys that are comfortable to use. This is a condensed keyboard – there's no numeric keypad – but this is better than trying to cram too much onto too small a space. Interestingly, the Return key – usually the first casualty – is big, chunky and very easy to hit. Unfortunately, usability is let down somewhat by the touchpad: it's not particularly responsive and suffers from left and right click buttons that are too heavy and a pain to use. The cursor also has a tendency to lock into the scroll bar at the slightest provocation which can be annoying when navigating a web page. While the smaller screen is ideal for portability, purists may prefer a 15.6-inch laptop for enjoying multimedia content. Also, the Inspiron 14z's screen isn't one of the brightest we've seen. There's no lack of detail or colour reproduction but we have to admit that an immersive movie experience isn't this laptop's strong point. If you want to play high-definition content you can, although you'll have to stop short of 1080p resolution and content yourself with the more modest 720p. Performance wise, the Inspiron 14z doesn't go the whole hog with a Core i7 processor, opting for a less powerful second generation Core i5 2430M chip instead. The result is a supremely powerful laptop at a price that still appeals. And, while you don't want less than 4GB RAM, you don't really need more either. There's a lot to like about this laptop – like its long battery life and portable design – but we also noticed one or two niggling flaws that got in the way during prolonged use. 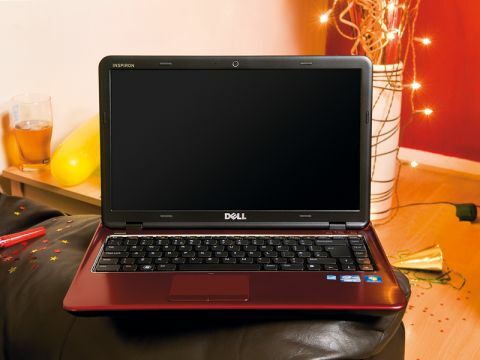 However, owning a laptop of this quality for under £600 is a fantastic deal that shouldn't be missed.